Roberts stated “Judge Turner’s vision, leadership and ability to move his community and thus Kentucky forward exemplifies his dedication to the citizens he serves”. Roberts commented that Judge Turner’s fellow Judge/Executives around Kentucky recognize Turner’s leadership and management abilities. “Judge Turner is the one we turn to when we need advice on how to address problems from finance to management of our road system in county government”, Roberts stated. “There is no one that knows more”. Roberts continued by saying “Judge Turner has been a mentor for each of us and we’re very fortunate to have learned from the best”. Turner is the only person to have ever served multiple terms as President of the Kentucky County Judge/Executive Association and has served as its Legislative Chair for nearly 20 years. LaRue County Judge/Executive Tommy Turner was presented the “Kentucky’s Most Outstanding Judge/Executive Award” at the recent Kentucky County Judge/Executive Conference. 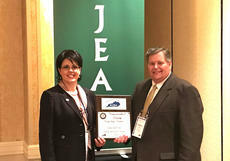 Bullitt County Judge/Executive Melanie Roberts, President of the Kentucky County Judge/Executive Association, presented the Award.